For all its convenience, online shopping comes with multiple risks. Although identity theft is more common in the real world, it still occurs online pretty frequently, as does credit card fraud. Staying safe while you’re shopping online is paramount, and knowledgeable shoppers know what approaches are best to take. You probably don’t often hear advice to use a credit card instead of a debit card or cash, but if you can do it responsibly, you absolutely should. Unlike debit cards, credit cards offer protection from identity theft. For example, with a credit card, your liability for fraudulent charges caps at $50 as long as you report the fraud within 30 or 60 days, depending on the company. However, if you’re using your debit card online and someone gains access to it, they can clean out your checking account before you even learn there’s a problem. It’s likely you’ll get part of that money back, but possible that it can take a while, and that you won’t get it all. So, use a credit card instead and pay off the bill monthly. Even better than using a credit card is to use a disposable credit card, which is also called a prepaid credit card. Disposable credit cards work like most gift cards. You add a specified dollar amount to the card, and it’s good until that amount is gone. Once the card has a zero balance, you can add more money to it, or purchase a new card. Visa and American Express both offer these cards in varying amounts, so they’re easy to purchase. The bonus is that if the number from a disposable credit card is stolen, it’s anonymous, and criminals can’t gain access to anything more than the dollar amount that’s still available on the card. The variety that’s available when shopping online can be dizzying, but it doesn’t stop at just the products and prices that are available. Different levels of security are also available online, and you want to be aware of them. Some online web sites don’t offer secure shopping, which means that savvy criminals can capture everything that you enter into a form on those sites, including your personal and credit information. If you’re going to shop online, limit yourself to secure sites. You can tell if a site is secure by the URL. A secure web site starts with https:// instead of http://. Secure sites also have a small lock icon in the lower right corner of the screen. If you plan to do any shopping online, do it at home. At home, you can shop in your pajamas and at any time of the day or night. You also know who accesses your computer at home. If you’re using a public computer to do your shopping—at the library, at a cyber café, or at work—you have no control over who also might be using that network. You also don’t have any control over what kind of spyware or malware might be infecting that computer. Therefore, it’s much safer to solely shop at home. 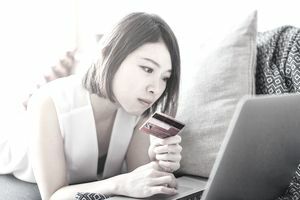 Many shopping sites, such as Amazon.com’s OneClick shopping, offer you the ability to save your credit card information on their servers to speed up the shopping process. It’s definitely faster, but there are some risks to maintaining your personal information elsewhere. If a company that you’re shopping with has a data breach, your personal information could be put at risk. It takes a little longer, but instead of storing your information on a server over which you have no control, just enter it yourself each time you shop. Price and selection are two of the best benefits to shopping online. But don’t let the benefits lull you into complacency. Take the time to shop securely, and use caution with the sites where you choose to shop. Then, not only can you find great deals, but you can do it without the worry that your identity will be stolen in the process.